Tarazed's Many Hobbies: Spinning hemp. After tooling around the Ravelry forums, I found a thread talking about drive bands for the Schacht wheels, and since I've just paid for a Ladybug on Sunday (squee! ), I decided to have a look. In it, one of the moderators mentioned making a spare drive band out of hemp, in a 2 x 2 cabled construction. Well, I happened to have 8 oz of hemp sitting around, that I got fro Aurora Silk a few years ago, and played with once, but then put away and mostly forgot about. So I got inspired, and grabbed it and my Trindle, and started spinning. 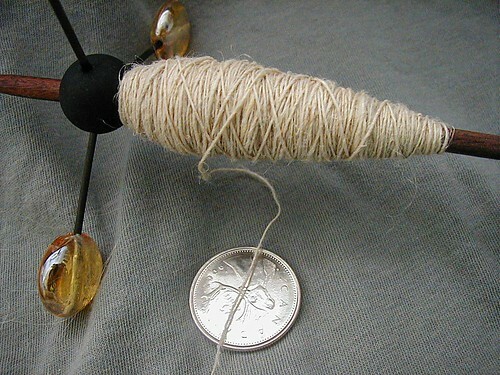 I'm wet spinning it at about a laceweight singles. 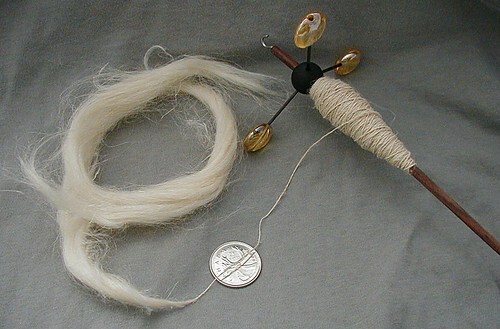 I figure I'll spin maybe a half ounce, then 2-ply it, and then cable as many of that together as I need to get a size close to the driveband once my wheel arrives. I'll have to find some time in the next few weeks to finish it up, then start plying it.